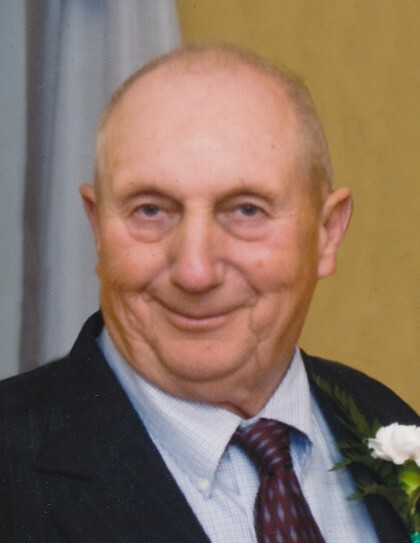 Joseph Carl Haberli, 80, of West Jacksonport, passed away Saturday evening, August 11, 2018 while in the loving arms of his family at home. He was born May 16, 1938 in Sturgeon Bay, the son of Milton Haberli and Marvel (Schultz) Haberli. Joseph attended Sevastopol High School. On April 23, 1960, he married Mary Lou Martinson at St. Joseph Catholic Church in Sturgeon Bay. Together, they farmed in the Town of Jacksonport since 1962. Joseph was a member of Zion Ev. Lutheran Church in West Jacksonport. He loved spending time with his grandchildren and farming. Joseph will be sadly missed by his children, Mike (Heidi), John (Laurie), Lisa (Bruce) DeGrave, Lori (Al) Buhrow, Jay (Shannon), Mark (Kathy), and Betsy (Chuck) Ploor; grandchildren, Katie (Mike), Robert (Mallory), Mandy, Tony (Becca), Cara (Todd), BJ, Katie, Molly (friend, Jonathan), Alan (friend, Tamara), Dana (Adam), Juli, Monica (Craig), Matt (Kayla), Melanie (Martin), Mackayla, Sam, Shayna, Joey, Miah, Kody, Ruby, Madi, Austin, Emily, and Ida; great-grandchildren, Bailey, Ethan, Brenna, Charlotte, Chloe, Lacey, Brynlee, Chase, Andrew, Brock, Kaiden, Keegan, Lola, Craig, Oliver, Eloise, Lilly, Luna, Bella, Mia, and Lucia; sisters, Audrey Hempel and Gloria (Frank) Bley; special friend, Mary; and many nieces and nephews; and cousins. Joseph was preceded in death by his parents; wife, Mary Lou; daughter, Kim; sons, James and Paul; grandson, Drew, and granddaughter, Amber; sister, Barbara Haberli; brother-in-law, Darrell Hempel; and sister-in-law, Rosalie Roatch. Funeral services will be held at 11:00 a.m. on Wednesday, August 15, 2018, at Zion Ev. Lutheran Church in West Jacksonport, with Pastor Peter Lindemann officiating. Burial will follow in Zion Ev. Lutheran Cemetery. Family and friends may visit with Joseph’s family at Huehns Funeral Home in Sturgeon Bay on Tuesday, August 14, 2018 from 4:00 p.m. until 8:00 p.m. and at Zion Ev. Lutheran Church on Wednesday from 10:00 a.m. until 10:45 a.m. A devotion will be held at the funeral home on Tuesday at 6:00 p.m. In lieu of flowers, memorial donations can be made to Zion Ev. Lutheran Church for a new church sign. Expressions of sympathy, memories, and photos of Joseph may be shared with his family through his tribute page at www.huehnsfuneralhome.com.